OROCRM WooCommerce Connector : OROCRM WooCommerce Connector is a module to synchronize WooCommerce data to the OROCRM platform. By using this module, you can easily synchronize the orders, customers, and products of WooCommerce to OROCRM. This feature helps admin to manage their store data in a better way on OROCRM and provide a better customer service. Synchronize WooCommerce Customers to OROCRM. 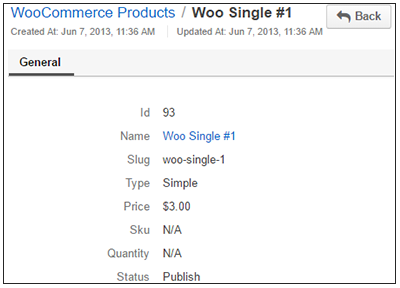 Synchronize WooCommerce Products to OROCRM. Synchronize WooCommerce Orders to OROCRM. Once the OROCRM is connected with WooCommerce, admin can navigate to "Customers > WooCommerce Customers" to synchronize the customers. Here admin can see complete list of customers and also he can view particular customer. Admin can check name, email,phone number and the orders which are placed by the customer. Admin can synchronize all the customers. Admin can view customers list. 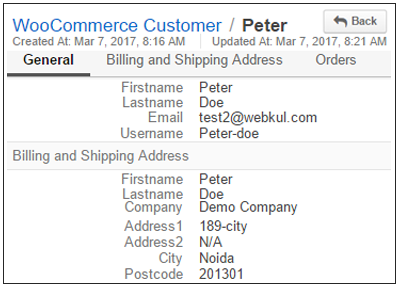 Admin can view customers details. 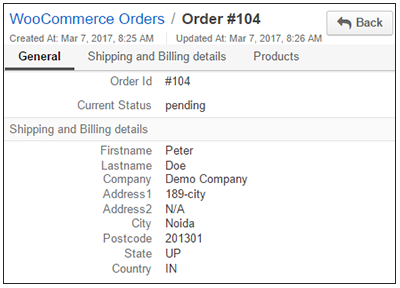 Once the OROCRM is connected with WooCommerce, admin can navigate to "Sales > WooCommerce Orders" to synchronize the orders. Here admin can see complete list of orders and also he can view particular order. Admin can check order ID, status, product, and order history. Admin can synchronize all the Orders. Admin can view order list. Admin can view order status and history. Once the OROCRM is connected with WooCommerce, admin can navigate to "Sales > WooCommerce Products" to synchronize the Products. Here admin can see complete list of Products and also he can view particular Product. Admin can check product name, product id, model, etc. Admin can synchronize all the Products. Admin can view product list. Admin can view product details. Did you buy WooCommerce OROCRM Connector?